For most of us in aviation, we distinctly remember always having a fascination with the miracle of flight. 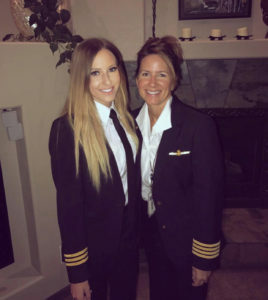 And this is no different for Detroit based First Officer – Brooke Patterson. 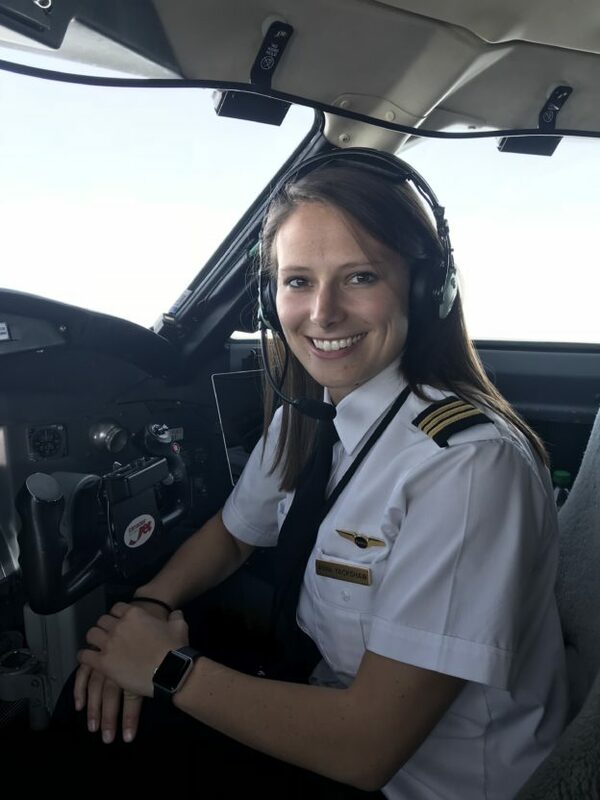 Inspired by her mother’s successful flying career and love of aviation, Brooke embarked on her own path to becoming a pilot. Read her story below! My mother had been a pilot for United since before I was born, and because of that I was exposed to aviation at a young age. I was fortunate to have parents who wanted me to find my own path in life and encouraged me to explore all of my career options. I graduated high school and went to college with an undeclared major. Although I love travelling, I didn’t know I wanted to be a pilot until after I was well into college. There was something so exciting about showing up to the airport and looking at all of the “heavies” behind the glass windows. Boarding the airplanes, I always stopped by the cockpit to see the controls, panels and lights. I loved getting the window seat and listening to the pilots talk on the ATC radio option. (Remember when you could plug headphones into the armrest and listen in on the pilots talking on Channel 9?) I was the kid on the airplane with her faced pressed against the window staring at the ground below, hoping for a turbulent flight as it was “more fun”. I knew I loved flying, but I never considered becoming a pilot because that was my mother’s career. While I was still in college, my mother would occasionally bring me along on her trips. I got to see some really cool places, and my favorites were Beijing and Hawaii. Not only did I get to see the world, I got a behind-the-scenes view of the life of an airline pilot. I got to see flight ops, where the pilots meet before flights to go over their flight plans. I watched my mom go through her flows and set everything up in the cockpit before I went back to my seat. I loved watching her interact with passengers and hand out wings to kids who boarded the aircraft. This is when it finally clicked for me that this is what I wanted to do. I was actually on the beach in Hawaii while out with my mother and her crew when I decided I wanted to take an intro flight. I really admired my mom’s hard work, dedication and passion for her job. She was an amazing role model for me, and I learned that with hard work and dedication I could achieve anything I wanted. Flying wasn’t just my mom’s career: now it could be mine, too. It wasn’t a surprise that after my first intro flight I was absolutely hooked on flying. With the support of both of my parents, I enrolled in ATP Flight School in Denver to get my ratings. In seven months, I went from zero flight hours to CFI, CFII and MEI. It was a seven day a week program to which I dedicated all of my time. I had amazing instructors who mentored and encouraged me all of the way. I loved how much I was learning and improving with each flight, and it only fueled my passion to get to the airlines. To build my flight time, I was a flight instructor based in Scottsdale, Arizona. It increased my knowledge base and put me in scenarios that allowed me to make pilot in command decisions. The experience that I gained during that time was invaluable. As I got closer to reaching 1,500 hours of flight time, I began interviewing with different regional airlines. I received a couple of job offers, but I knew SkyWest was where I wanted to fly. I love the crews I fly with and the sense of community I feel at work. I met some amazing people during new hire training who have become life-long friends. I absolutely love what I do for a living. I’m so thankful for my supportive family, friends, instructors and co-workers who have encouraged and mentored me through my aviation journey. I wouldn’t be where I am today without them. 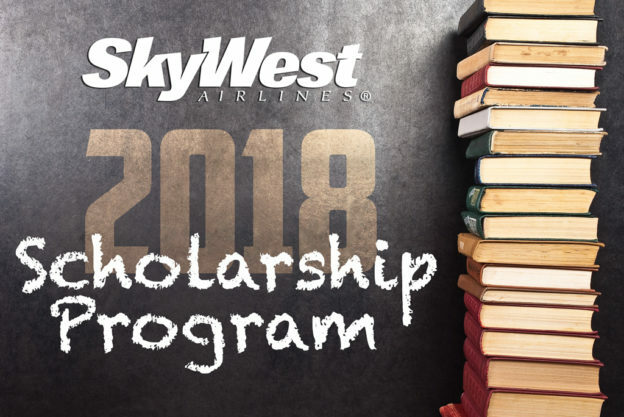 For more information on becoming a SkyWest pilot, visit skywest.com/pilot. 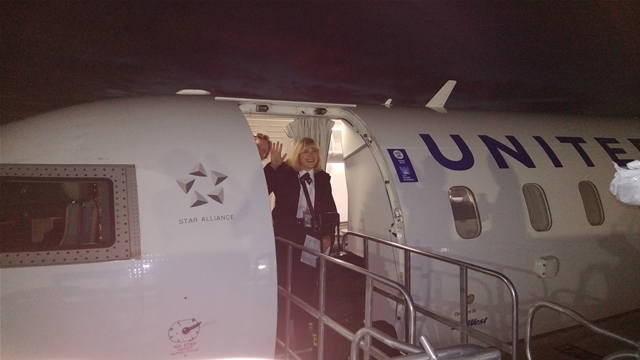 Anna Yackshaw, a SkyWest CRJ first officer, was born into a family of aviation. 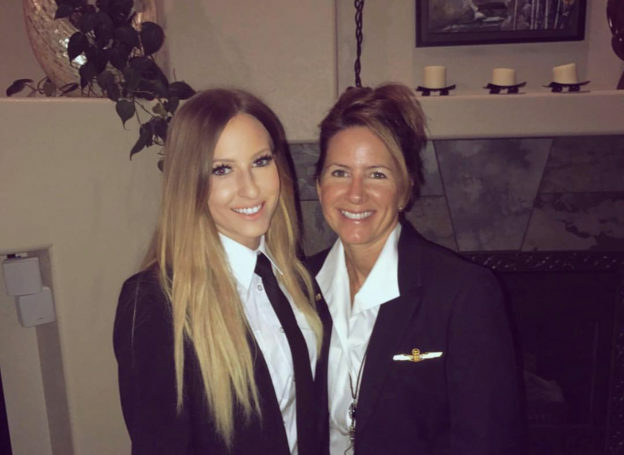 Often going on imaginary flights with her grandfather, a Corsair pilot, her decision to fly professionally was made long before she reached the conclusion on her own. It wasn’t until after a visit to the University of Dubuque during high school when Anna knew her childhood imagination would soon become more. 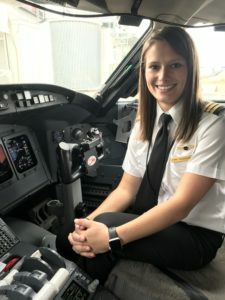 She headed to flight school and eventually found herself in the right seat of a flight deck, flying for SkyWest. Growing up I was very fortunate to spend a lot of my childhood with my grandparents. My grandfather and I were practically inseparable. He was a Corsair pilot and mechanic for the Navy during WWII and continued to fly recreationally after the war had ended. I loved hearing all about his flying stories, and we would go on our own ‘imaginary flights’ almost daily. Little did I know that this game of pretending was foreshadowing my own career down the road. After taking countless career assessment tests in high school and not being at all excited about any of the results, I went to visit a friend of mine who was already in college to see if he had any advice. Although he was helpful, it was his college, the University of Dubuque, that guided me to my answer. Dubuque had their own flight school. I was talking to some of his friends who were in the program and they were telling me how they flew for class. How cool is that?! 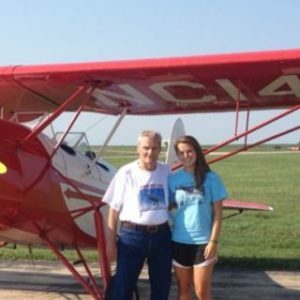 For this Midwest girl who grew up flying imaginary flights with her grandfather, it was the perfect fit. When the hours in my logbook finally totaled that magic number and I wasn’t in love with my corporate job at the time, I once again reached out to friends for advice. Fortunately, having attended a flight school left me with plenty of friends scattered all over this industry. The trend I noticed the most was that everyone was happy at SkyWest, and I felt that I received the most positive feedback from those who flew for SkyWest. That feedback, in addition to my own research on the company, made it seem like the obvious choice. The people are definitely the best part and biggest asset to this company. From the training department to the crews that I fly with on the line, I couldn’t ask for better co-workers. I have made friends here that will be in my life indefinitely. I love that my job doesn’t feel like work. There are days when our paychecks are definitely earned, but overall I love that I don’t feel like I’ve gone to ‘work’ a day in my life because I love what I do. I love watching the sun rise and set at 30,000 feet. I love when we have kids on board that want to come see the cockpit and watching their faces light up when I give them a pair of wings. In addition to these perks, no day is the exact same. This job is constantly challenging me and pushing me to become a better pilot. Always having the opportunity to learn is something that I feel many take for granted. The most common reaction is shock. Whether it be my age or my gender, I’m not sure. My favorite reaction is when people are simply happy for me and don’t make a big deal about it. I love what I do, but I don’t think it deserves a spotlight over anyone else’s career. How have you seen the role of women in aviation change? 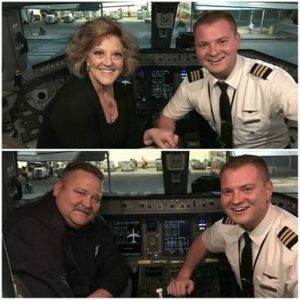 I think the general public is still use to seeing more male pilots and female flight attendants than vice versa, but I can see those roles continue to diversify with each crew I fly with. In our ever-changing world, I think there will always be challenges but I see them becoming fewer and fewer as time goes on. 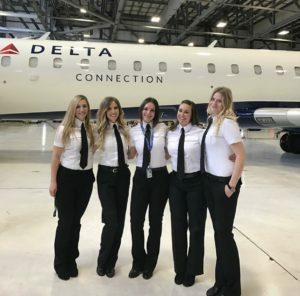 The growth in size and popularity of the Women in Aviation organization is a great testament to the progress and successes that women have had in this industry. Stop thinking about it and start working on it. 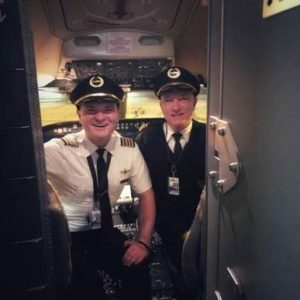 This is an amazing career path and even though it comes with its share of sacrifices, I don’t think there is another job out there that compares to the rewards of being a pilot. Everyone knows that this is a male-dominated industry, but don’t let that get in your head. Instead of becoming a ‘female pilot’, just become a pilot. We all show up to the airport to do the same job. Stay strong and confident and be a good role model for those aspiring aviators following in your footsteps. Fly safely and follow your dreams! 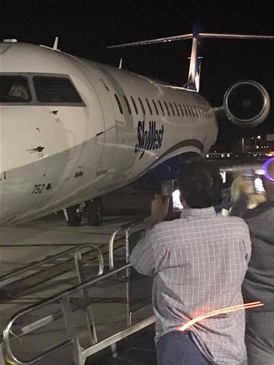 SkyWest is a proud supporter of Women in Aviation and will be attending the 2018 Conference later this week. Come meet with our recruiters Thursday through Saturday, March 22-24, and learn more about a career with SkyWest. There will also be an opportunity for on-site interviews for those ready to Take Control of Their Careers. Visit our career guide to learn more about flying with SkyWest. 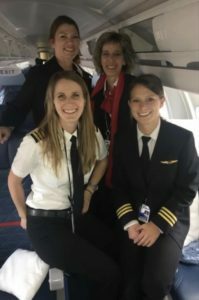 For more inspiration on women in aviation, take a look at this blog post, featuring SkyWest First Officer (recently upgraded to Captain!) Koko Kostelny. 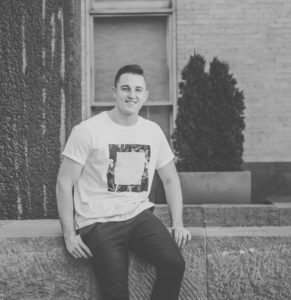 When asked what he wanted to be when he grew up, Jake Nelson always had an answer: a professional airline pilot. 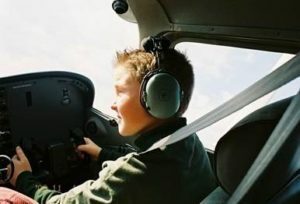 He was just 9 when he flew his first airplane, and the rest is history! With help from an encouraging mom and dad as well as many supportive mentors along the way, Jake was able to achieve his dream. 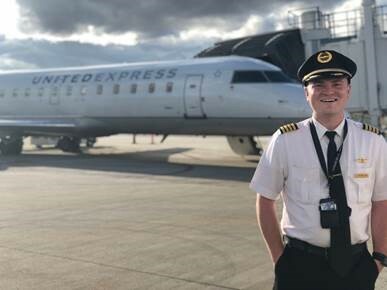 Read on for his story of becoming SkyWest Captain Jake Nelson. Hello everyone! My name is Jake Nelson. I am honored to fly for SkyWest Airlines. I recently accepted the upgrade to CRJ Captain in our new Atlanta domicile, and I couldn’t be happier. Everyone’s path to the airline world is different – that’s what makes this such an exciting industry. This is my story. I knew I wanted to fly since I was a very little guy. I grew up in the high desert of Los Angeles County, near Edwards Air Force Base. I can remember my parents taking me out to sit near the end of the runway at USAF Plant 42 (also known as Palmdale Regional Airport – KPMD for you fellow AvGeeks!) to watch the airplanes practice in the pattern. I’ve known since then that I belonged in the sky. My path to learning to fly was nothing short of magical, and I am honored to have come in contact with some amazing mentors and cheerleaders throughout my journey. When I was 9 years old, I was given the opportunity to take part in the EAA Young Eagles program. I was taken up in a Cessna 172 and allowed to fly the airplane around my hometown. I circled over my school, my house and around the neighborhood I grew up in. I knew that day that I was born to be a pilot. I never felt more sure of anything in my life. I was encouraged by my family (shout out to Mom and Dad for “letting me do my thing”) and mentors to study hard and chase my dreams of flight. I worked tirelessly through school and spent every spare moment soaking in everything there was to learn about airplanes. My junior year of high school, I was invited to attend the UND Aerospace summer camp in Grand Forks, North Dakota. I spent a week flying small airplanes, attending aviation seminars and living in the dorms. I knew I wanted to pursue a degree in aviation when I graduated high school. My senior year, I applied for and was accepted to Arizona State University’s professional flight program. 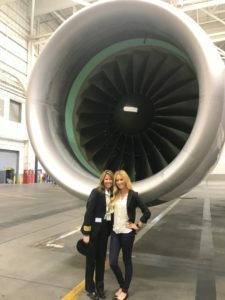 I spent three and a half years in Mesa, Arizona, learning how to fly and become a well-rounded professional airline pilot. I was honored to be “First to Solo” amongst my class and eventually earned my Private Pilot license at 18 years old. When I left Arizona State, I was a Multi-Engine Commercial Pilot as well as a Multi-Engine Instrument Certified Flight Instructor. My “Path to 1500 hours” was an amazing and exciting time in my young life. I flight instructed in the daytime at the Edwards Air Force Base Aero Club, where my first flight as an instructor pilot at the Aero Club was in the very same airplane I had my Young Eagles flight in 13 years earlier! And by night, I flew on behalf of the city of Lancaster for Los Angeles County Sheriff’s Department. The days were long, but I reveled in every moment. I think I spent more time in the air than on the ground during that time! In October of 2013, I applied to become a SkyWest Airlines pilot. 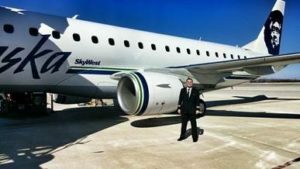 There were many factors in my decision to join the SkyWest family, and I was drawn to SkyWest for many reasons. Being a “West Coast guy” I knew that I wanted to join a company that had a large West Coast presence. I also knew that I wanted to join a company with stability and a proven track record of growth and opportunity. While in college, I worked as an intern/instructor for another regional airline. Although I learned a lot from that company, it solidified my decision to join the SkyWest team when I earned the required flight hours. I was fortunate to receive an offer for First Officer with SkyWest and began ground school in December of 2013. Our ground school class was pretty amazing. It was hard work, but it was incredibly rewarding. I spent nearly a month in Salt Lake City working alongside my classmates and instructors. I made lifelong friends – I have a group text with my classmates that we still talk in every day, nearly five years later! 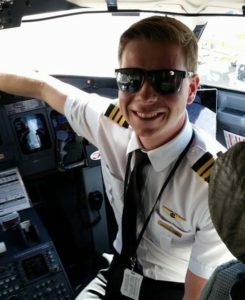 What really impressed me about SkyWest was how they strive to build “the next generation of professional aviators.” Enter: Captain Brian Swift. 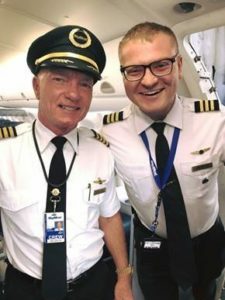 Captain Brian has been with SkyWest for nearly 30 years. He serves as a Check Airman and is responsible for training new pilots “on the line.” When Captain Brian was introduced to our class, we immediately connected. He would make sure that my study buddies and I were on track during ground school. He even hosted us at his home in Salt Lake for dinner and a review session before our big Systems Validation Test. After Initial Operating Experience (IOE) with Brian, I was based in Minneapolis and after a month in MSP, I was able to transfer to Los Angeles. Life was pretty amazing – I was an airline pilot flying around the West Coast. Nothing made me smile bigger than being cleared to descend via the SADDE6 arrival into Los Angeles (now the IRNMN1 arrival for those AvGeeks following along at home). On a clear Los Angeles night, you could see the whole LA Basin, turning toward the runways right over downtown Los Angeles. During my time as a First Officer, I had the opportunity to work with some incredibly talented and experienced crews. Many captains and flight attendants in our Los Angeles domicile have over 20 years of experience with the company. It is always an honor to share stories and lessons learned from their time in the industry. So I clicked “submit standing bid” for Atlanta CRJ Captain. A few days later, I received the email confirming I was awarded the position. I was over the moon. After jumping up and down with Mom and Dad in excitement, I knew who I had to tell first: Captain Brian! Brian was ecstatic and immediately offered to help with training. I once again accepted his offer for help and guidance. I returned to Salt Lake City for ground school and simulator training, and I was sent to our Fresno and San Francisco domiciles to complete IOE training on the CRJ 200. Have you been considering flying for becoming a pilot at SkyWest? Check out our pilot career guide to learn more and to apply. 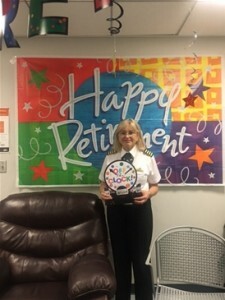 After 32 years of dedicated service, Palm Springs (PSP) Captain and SkyWest’s first female captain Mary Conti retired on Saturday. Captain Conti was one of the first female pilots at SkyWest and the longest-tenured female pilot in SkyWest’s 45-year history. 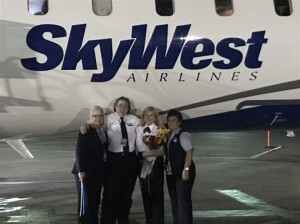 Captain Conti began her SkyWest journey during the SkyWest/SunAire merger in 1985 after being rejected at other companies strictly because she was female. “There were corporate jobs and you knew you were being turned down because you were a female. They could actually tell you that back then,” said Captain Conti. Her initial training at SkyWest was completed in one of SkyWest’s first hangars at the old St. George, Utah airport in 1985. Following training, she went to PSP to fly, where SkyWest’s acquisition of SunAire was still in transition. 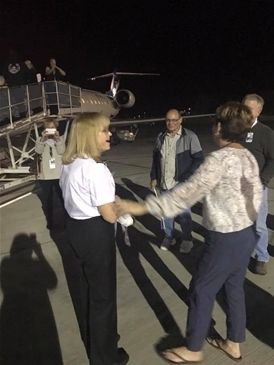 Nine months later, she and two other female pilots upgraded to captain together, becoming SkyWest’s first female captains. 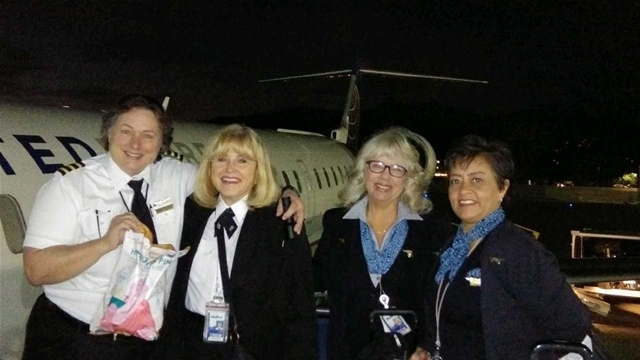 Bringing her journey full circle, Captain Conti completed her final flight last week from San Francisco (SFO) to PSP with an all-female crew. 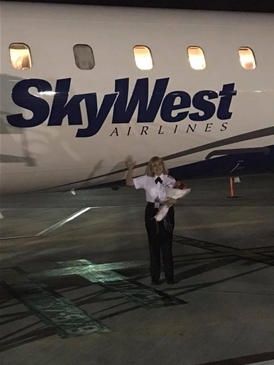 The first SkyWest employee Captain Conti happened to meet when she got to PSP was a check airman who soon became chief pilot. He is now her husband of nearly 30 years and they have one daughter. 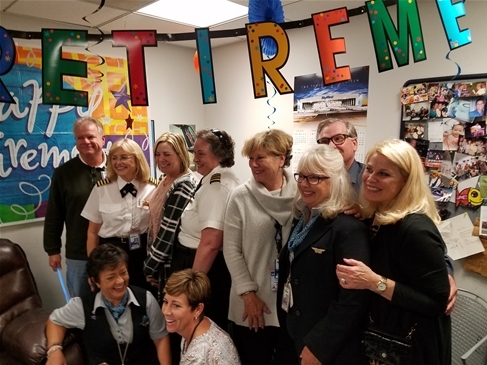 After her first two years at SkyWest, Captain Conti says she knew she wanted to stay and was based in PSP her entire career – with the exception of a few months after upgrades and transitions. Please join us in thanking Captain Conti for her more than 32 years of dedicated service. Congratulations, Mary! 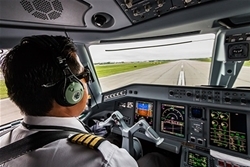 SkyWest is known for one of the best pilot training programs in the industry. From a pilot’s first contact with SkyWest’s training department at our ATP CTP course to captain upgrade training, SkyWest is focused on professionalism and proficiency for every pilot. We use an AQP curriculum, and our certified SkyWest instructors are all SkyWest pilots who know what it’s like to fly the line. This makes it so our pilots are uniquely prepared for their upgrade to captain around 2 years. SkyWest pilots have more opportunities to Take Control of Their Careers than any other regional pilot, including the best training, quality of life and career advancement opportunities. Learn more about our current upgrade times by visiting skywest.com/pilot and checking out the “Seniority” tab. Be ready for your upgrade and Take Control of Your Career. Apply Today!